We’re pleased to announce the winner of the 2016 Kenny Feldman Animal Advocate Award. We’ve created this award to recognize a person, organization, or business in our community whose amazing work is pushing the ball forward for animals. 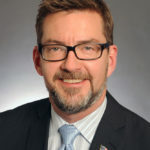 This year, we’re giving the award to Minnesota State Senator Scott Dibble. This July, I served as a camp counselor at Youth Empowered Action (YEA) Camp, a camp for teenagers who want to change the world. The camp empowers teens on a variety of social justice issues, and the particular camp where I served was focused on animals. The experience was incredibly challenging and rewarding. The camp ran from July 17 to 24 and was located at Woodstock Farm Animal Sanctuary. Like any camp, we slept in cabins with several others, ate together, played games, and hiked in the woods. The special aspects of this camp were meeting and engaging with the farm animal residents and training youth on how to be activists. Some of the topics of the talks that I led were how to conduct grassroots outreach, why people choose to become vegan, and nonviolent communication. It was satisfying to lead workshops on these topics because I have extensive experience in these areas and strong opinions about them. Other topics included challenging racism, sharing meaningful items from each camper, opposing sexism, and working with campers to determine their activist plan for the year. I am so happy that I met you at YEA Camp! You inspired me to do great things with my life! … You always made me laugh and I loved when you danced! You always brought the good out of me and I had so much fun with you. You inspired me to ignore what other people thought and do what you like to do. At the beginning of camp I always wanted to join you jumping, but I was embarrassed about what the others would think of me. But, I started jumping with you on the last full day of camp! It was so fun! I didn’t care what the others were thinking, or that people were taking videos of us, I just wanted to have fun! YEA camp inspired me so much that I realized how much more confident I was at the end then I was at the beginning. I talked so much more louder and I didn’t care what others thought. She later asked for my assistance in her activism, and I connected her with additional resources. I had so much fun at camp and at the same time developed deeply moving connections with young activists. I was excited to meet the camp director, Nora Kramer, for the first time. We knew many animal activists in common across the country, but we hadn’t yet met face-to-face. She’s a powerful force for the animals and for social justice and was devoted to the development of the campers. She was attuned throughout the camp to the needs of both the campers and the staff. I felt inspired by Nora to have a broader view of empowering new activists and helping them develop their confidence, knowledge, ability, and enthusiasm. Several of the campers as well as the younger staff inspired me. They are curious, driven, and kind. I’m glad I invested my time and energy in helping to cultivate an experience in which they can learn about how to be an activist, challenge themselves to be more courageous and gentle, and meet and connect with new and experienced activists. I feel hope for the animal protection movement. 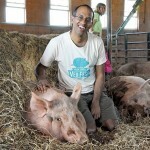 I’ve enjoyed working with Compassionate Action for Animals over the past eighteen years, first as founder and then as executive director for the last five. After careful thought, I realize the time has come for me to move on, and I’ll be stepping down from my staff position in January of 2017. Having been deeply involved with CAA since its inception, I realize I need a break, including some time to relax. While I don’t have any specific plans, I intend to stay in Minneapolis, continuing on my path of becoming the most effective advocate for animals that I can be. I’d like to consider new strategies and turn my focus to influencing institutions, such as food service providers and the government. I’m also interested in having my work more closely align with advocating against racism, sexism, and other ways that our society exploits humans. My life’s work is to promote compassion, and CAA has been an incredibly fulfilling vehicle for that work. I’m proud to say that CAA is currently in a strong financial position with thriving programs, high morale, and unprecedented volunteer support. I wholeheartedly believe in the work we do and encourage your continued participation. Please donate, volunteer, come to our events, and continue to speak out for animals. 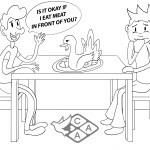 I believe that CAA has been and will continue to be a powerful and effective voice for the animals. My wish is that my leaving will be an opportunity for you and the organization to become even more powerful forces for the animals. The role of executive director for CAA is an important one, and this transition will allow for other voices in the movement to have more leadership. In that, there’s a great potential for expanding diversity and strengthening the organization. The board of directors is currently assembling a hiring committee and will be announcing the position opening soon. If you or someone you know might be interested in applying, please stay tuned for the job posting. I look forward to working with you over the next few months as we continue our important work, and at the top of the agenda is Twin Cities Veg Fest. (The festival’s fundraising campaign is currently underway!) After my departure in January, I can be reached at unnypn@gmail.com, 612-293-6876, and on Facebook, Instagram, and Snapchat as unnypn. And of course you can find me biking on the streets of South Minneapolis (listen for my singing). It’s been a pleasure working with you. I’m so grateful for all the progress we’ve made for the animals, and I’m also grateful for all the wonderful relationships I’ve developed with you. I look forward to all of that continuing into the future. Is it ok if I eat meat in front of you? You’ve probably heard it before. You sit down to a meal with a friend, co-worker, parent, or classmate, and they ask, “Is it ok if I eat meat in front of you?” And you find yourself with mixed feelings about how to respond. Let’s talk about it. When this happens, the first thing we can recognize is that the person who asked the question is being conscientious about you, your beliefs, and eating habits. This is great! But it gets harder from here. Their question was not “What happened to the animal before they died?” or “Should I start eating more plant-based foods?” The concern is about you and not necessarily about the animal. We can respond in a way that inspires the other person to consider the effects of their food choices and shift toward eating foods that cause less harm to animals. First, acknowledge their concern about you. A simple “thanks for asking” will suffice. Second, you may also want to express how you feel. If you’re uncomfortable, you could say, “Yes, it’s difficult for me to be around this because I care about what happens to animals.” Third, reaffirm their choice. While we know very well the dire effects of individual choices on the lives of animals, in this context, showing your respect for the other person’s autonomy gives them space to make their own choices. When they don’t sense a demand (whether in the moment or in the ongoing relationship), it’s easier for them to consider changing the way they eat. Saying “I respect your choices” or “I want you to make your own choice about what to eat” will more likely inspire them to be open-minded. Of course, what you choose to say and how you choose to say it will depend on your relationship with this person and on how you’re feeling at the moment. Remember that your tone of voice and body language are also powerful communication tools. Be forgiving of yourself if you can’t muster patience in every conversation or find the right words to say. When you consider the treatment of animals regularly and reflect upon your behavior, you’ll find it easier to respond positively and constructively. And you’ll make a huge difference for animals. As advocates for animals, we want to reach people with our message of compassion for animals and help others make compassionate choices. We have many opportunities to engage in online discussion, but the conversations can be fraught with conflict, misunderstanding, and pain. However, we can do things differently. 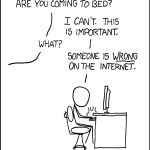 The first thing to remember is that online discussions are not the best way to communicate. If you can talk about animals with other people face-to-face, then do so. Be proactive in starting those conversations, whether at an outreach table or by sharing vegan food with friends. When online discussions start and you find that people are interested in discussing the topic further, invite them to have a face-to-face discussion. In-person discussion allows for nonverbal communication, including gestures, facial expressions, and tone of voice, all of which can increase empathy and understanding. There’s generally no need to respond right away. Give yourself time. Stop and breathe. Find peace in yourself before responding. Treat each person as an individual with their own needs, desires, and autonomy. You are much more likely to understand their perspective and also have them understand you. Listen to the other person. Start your comment or message by paraphrasing to show that you understand. Ask sincere questions to understand their perspective better. Show respect. Avoid sarcasm and condescension. Model open-mindedness. When people see that you’re listening and trying to understand, they are more likely to do the same. Since empathy works best in person, accommodate for the medium. When you communicate, imagine your words being interpreted in the worst light and then edit your comment to help the other person understand your perspective. And on the flip side, interpret their words in the best possible light. When providing factual claims, cite sources that most people are likely to agree are reliable (e.g. industry or academic sources). Build bridges. Use the debates as an opportunity to find shared values and common interest that will keep the discussion going. In public or group discussions, most readers (especially those who are undecided) never comment at all. This means that the people you’re most likely to influence are not the people who are commenting, and those people are more likely to listen to you and agree with you if you are respectful and seek to learn the truth. None of this is to downplay the real anger we may feel about animal cruelty or the frustration we may feel when those we care about are engaging in animal abuse. Those feelings are real, yet acting them out is not helpful. Cool down and respond with compassion and goodwill for both the animals and your audience. This has been a landmark year for our CAA community and for our global movement. We hope you’ve been able to attend a few of our events over the past year, from the dine outs and potlucks to the Vegan Chili Cook-Off and Twin Cities Veg Fest. 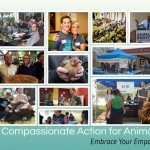 As you may have noticed, our community of animal advocates is growing. This progress reflects a global shift toward a greater awareness of animal protection issues and an increase in plant-based food options; undercover investigations of animal agriculture are getting more exposure while restaurant chains and grocery stores are introducing more vegan food. Hooray! Because of your generosity, the movement is thriving. We thank you for your past support and now look toward the future for animals. At CAA, we know that there is much more to be done to see that all animals get the justice they deserve. We are committed to this cause, but we cannot do our work without your continued financial support. Share the News: Twin Cities Veg Fest Is Coming! Follow and share our Facebook, Instagram, Twitter, Tumblr, and Pinterest pages. Also, RSVP and then invite your friends to our Facebook event. @tag “TCVegFest” on Instagram and Twitter, and tag our Facebook page. If your post also highlights another business or organization such as one of our exhibitors or a business you would like to be an exhibitor, @tag them too! If you have room, mention the date, location, and time: Sunday, November 1, 2015, 10am – 4pm at Coffman Memorial Union, Minneapolis MN. Post about our sponsors and exhibitors. If you know of a product or local food vendor that you would like to see participate in Twin Cities Veg Fest, let them know. 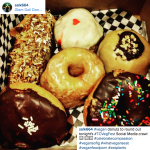 Tell them how 2014 food vendors such as Glam Doll Donuts were wildly successful and sold out by early afternoon. Then, post a picture of their product, tag them with @tcvegfest or with our Facebook page, and include the hashtag #TCVegFest. Post about our speakers and cooking demos. Post a #ThrowbackThursday (#TBT, #WBW, or #FBF) of a photo from last year’s Twin Cities Veg Fest. 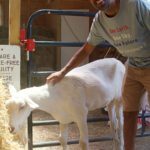 Why should I post about #TCVegFest? In addition to being a part of the team that makes Twin Cities Veg Fest a success, you have the opportunity to get a little extra swag. The top 20 social media posts on Twitter, Instagram and Facebook are guaranteed a swag bag on the day of our event (no need to get up early to wait in line), and those swag bags will include one extra special item! To participate for your chance to win, your social media posts must be public and will be judged by quality as well as popularity. Subscribe to Compassionate Action for Animals’ Weekly Update and forward emails about the festival to your friends. We’ll have a lot of exciting news about the festival coming up in the months leading up to the festival. However you choose to share the news, be sure to reach out to your friends who are not vegan or vegetarian. Over the years, we’ve learned that the most common way for non-vegetarians to hear about the festival is from their vegetarian friends. We’d love to have even more non-vegetarians come to the festival to learn about why and how to make more compassionate food choices. Your help getting them there is crucial. In addition to sharing the festival online, you’re welcome to help us promote the festival by distributing posters and flyers around town. Check out our event page for postering opportunities. Do you know of another way that we can get the word out? Let us know! 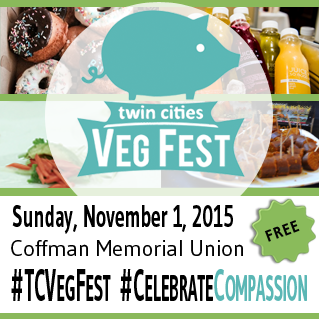 Join us and help make Twin Cities Veg Fest even better! We’re pleased to announce the Kenny Feldman Animal Advocate Award! We’ve created this award to recognize a person, organization, or business in our community whose amazing work is pushing the ball forward for animals. 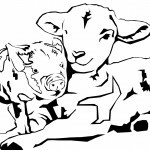 This year, we’re giving the award to The Herbivorous Butcher, our local meat-free butcher shop. After a few short years of selling their vegan goods at farmer’s markets and pop-up events, The Herbivorous Butcher is about to open their own storefront in Northeast Minneapolis. They’ve already made headlines around the country and world. Here’s why: they make incredibly tasty and interesting plant-based “meats,” they’re opening the first vegan butcher shop on the continent, and they have a fun, creative, and positive approach to their business. This is exactly what our movement needs: energetic advocates who are creating solutions. As people replace their animal-based foods with Herbivorous Butcher’s delectable vegan foods, fewer animals are killed for food. Hooray! This award honors the memory of animal lover Kenny Feldman. He thought animals should be cared for and allowed to a live a life with freedom. Kenny was a close friend of mine and inspired me to become an activist. 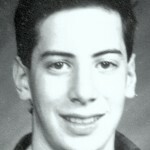 Sadly, we lost him to suicide 16 years ago. From that tragic loss, we are moved to establish this annual award to acknowledge the contributions of individuals who strive to create a more compassionate world. We will present the award at the Twin Cities Veg Fest Pre-Festival Party on October 30. This past September, a group of us who are CAA volunteers and also students at the University of Minnesota started a campaign to get more meatless options in the University’s dining halls on Mondays. As the campaign coordinator, I’m reporting on the progress we’ve made toward reaching our goal. Bringing the campaign to the University of Minnesota would have many benefits. Aside from this ultimate goal, the process of campaigning is also a powerful means of outreach. We are engaging students, faculty, alumni, University departments, student groups, and community members in a conversation about the effects of animals agriculture and the benefits of a Meatless Monday program.